I have provided all the documents, which is usually sought by the UK embassy. This is the third rejection letter which I received today. Before going to discuss my case, I would like to tell you something about my background. I am not from very rich class. I belong to middle class section of India. Working as an assistant professor in India. My annual package is approx 4915 pounds as per the Indian economy. I took the semester break N.O.C from University whenever I supposed to going out of country, which I also appended along with visa applications . My visa category is a tourist visa for the six months. I have shown them 2600 pounds as the current balance. The last time I have shown them 5000 pounds, but they have straightly rejected on the basis of intuitive feeling that how could a person spend his 6 months salary on any tour. Moreover, they were doubted about fluctuation in my bank balance. My invitee is a native British citizen. She has invited me visiting her country, Britain. I am genuinely seeking tourist visa, so where am I lagging in the whole scenario? I shall be grateful to you if you please suggest me how much money should I really show them, so that I do not waste my money for zero output? My appointment letter which stated that I have been working as A.P for the last year. All the photocopies of visa, Which I got so far. 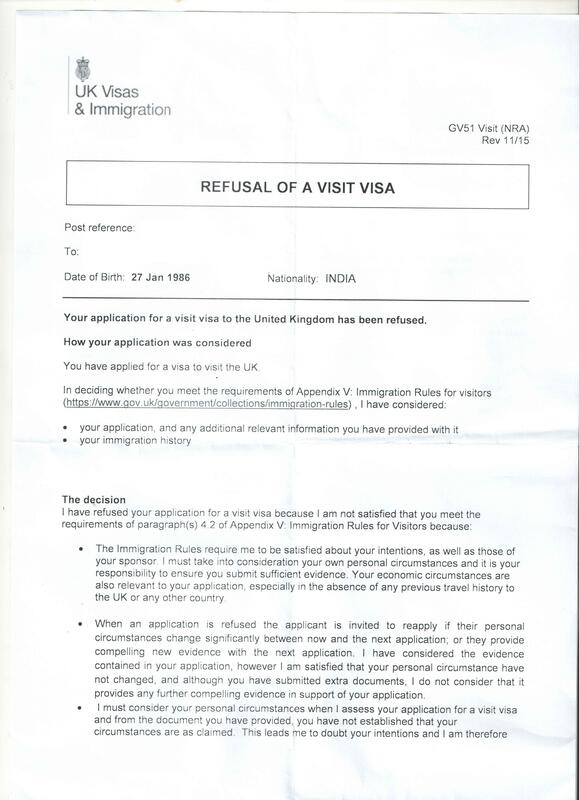 Nationality: INDIA Your application for a visit visa to the United Kingdom has been refused. 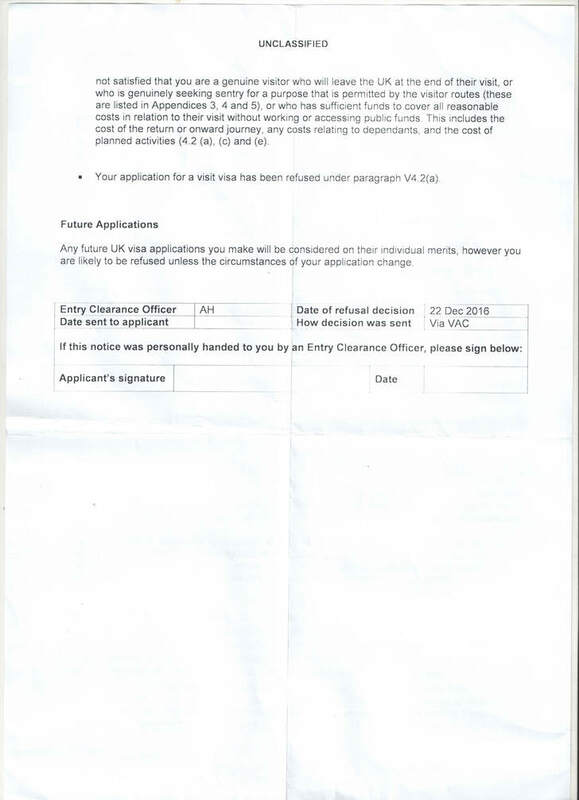 How your application was considered You have applied for a visa to visit the UK In deciding whether you meet the requirements of Appendix V: Immigration Rules for visitors (https://www.gov,u ovemmenticollectionsiimmigration-rules) , I have considered: • your application, and any additional relevant information you have provided with it • your immigration history The decision I have refused your application for a visit visa because I am not satisfied that you meet the requirements of paragraph(s) 4.2 of Appendix V: Immigration Rules for Visitors because: • The Immigration Rules require me to be satisfied about your intentions, as well as those of your sponsor. I must take into consideration your own personal circumstances and it is your responsibility to ensure you submit sufficient evidence. Your economic circumstances are also relevant to your application, especially in the absence of any previous travel history to the UK or any other country. • When an application is refused the applicant is invited to reapply if their personal circumstances change significantly between now and the next application; or they provide compelling new evidence with the next application. I have considered the evidence contained in your application, however I am satisfied that your personal circumstance have not changed, and although you have submitted extra documents, I do not consider that it provides any further compelling evidence in support of your application. • I must consider your personal circumstances when I assess your application for a visit visa and from the document you have provided, you have not established that your circumstances are as claimed. This leads me to doubt your intentions and I am therefore"
You are a lower-tiered academic who proposes to visit the UK during a semester break. Your financial position is weak and you are using a UK-based co-sponsor. You have applied three times unsuccessfully. A previous refusal was for disproportionate outlay (that's a bad thing). The exhibits in your question are from your 3rd refusal and it is a natural and predictable follow-on to the previous refusal. I shall be obliged if you please suggest me some valuable tips. You are in a tailspin of serial refusals and the ECO has made it clear that this chain of events has taken a life of its own ("...I am satisfied that your personal circumstances have not changed..."). The immediate remedy for serial refusals is to stop applying. While this "tip" may seem unnecessarily pedantic, we have serial refusal cases in the archives here that demonstrate people routinely ignore it. From the ECO's viewpoint you are obsessed with getting in to the UK and that's a very wrong message to send them. So stop applying, forget it, go elsewhere for a holiday, or rendez-vous with your sponsor in a 3rd country, or get diplomatic credentials, or become a monk on a mountain top and get them to come to you, or whatever; it's not going to work for you until your circumstances have been changed at the roots and branches. I didn't get what immigration history, they were talking about ? You (implicitly) want to know how to break the chain of serial refusals and to clear the record and to enjoy some mobility. Fortunately there is a wonderful panacea for this: successfully apply for an entry clearance. Once you have done this, your history will fade into irrelevance. There is no other cure quite like it. You show them an entry clearance and BAM future applications will go straight to the green triage on the first sift. Some might go to the orange triage, but this is where people have become overconfident. Instruct a solicitor with a nationally acknowledged practice area in serial refusals. You can expect this to be bloody expensive, but the option is there for you. We're talking in the neighbourhood of GBP 3,800 or so to unsnarl your imbroglio (if they even take you on) but that's a pure guess on my part. In all events, stop applying. Not the answer you're looking for? Browse other questions tagged indian-citizens visa-refusals standard-visitor-visas serial-refusals or ask your own question.